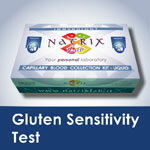 The Food Intolerance Test (F.I.T.) 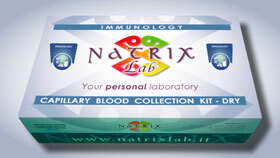 is performed using the ELISA method to identify the food protein that the organism reacts adversely to, available in the test for 46, 92 and 184 foods. Our everyday foods that we love and seem harmless, can hide substances that our body has developed food intolerances to: they are dose dependent reactions (proportional to the amount of the food eaten), whose symptoms are related to the build-up of substances our organism cannot tolerate, and which appear after a certain time since the food was eaten, which makes it difficult to automatically correlate cause and effect. Are you vegetarian? We have news for you! 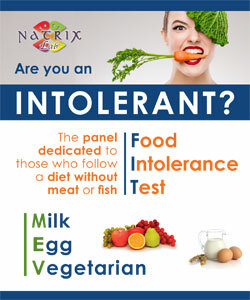 A vegetarian is a person who does not eat animals, birds and fish or products that contain them. Vegetarian diet models can vary considerably. The milk-egg-vegetarian model that is analysed in this profile, available in the test for 92 foods, is based on cereals, vegetables, fruit, pulses, seeds, nuts, dairy products and eggs. General symptoms: tiredness, fluid retention, bags under the eyes, postprandial sleepiness, halitosis, increased sweating. Nervous system: headache, anxiety, depression, irritability, lack of memory, difficulty in concentration, dizziness. Respiratory tract: hard to breath, asthma, cough, allergic rhinitis, sinusitis. Cardiocirculatory tract: change in blood pressure, palpitations, extrasystolic. Gastro-intestinal tract: bloated sensation, nausea, abdominal pain and cramp, alveoli disorders (diarrhoea, constipation), aerophagy. Urogenital apparatus: cystitis, urogenital inflammation, premenstrual syndrome. Muscle-skeletal apparatus: cramp, muscle tremors, weak muscles, joint pain, muscle-tendon inflammation. Epidermis: local and general itching, acne, eczema, dermatitis. How and where to take the test? Preparing for the test: there is no need to fast beforehand, the sample can be taken at any time of the day. 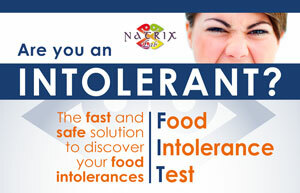 If the test discovers food intolerances, a food protocol should be adopted to recover tolerance in order to eliminate the foods that are not tolerated and then gradually reintroduce them. Beware of homemade diets: eliminating something from your diet should not be taken lightly because, for example, if you exclude the protein that you are intolerant to, you are also depriving yourself of the other nutrients that food contains, which you have to then find elsewhere. 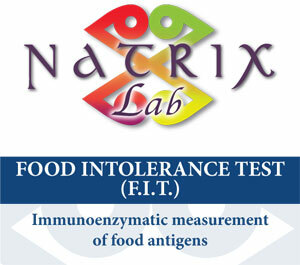 In more than ten years’ experience in food intolerance diagnosis, NatrixLab has perfected food protocols to recover tolerance. 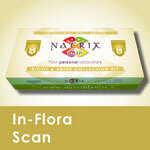 Please contact us for explanations about your test and how to organize a specific food protocol. 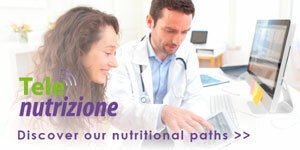 We recommend repeating the test after 6-8 months, to monitor the state of your general health and see whether the diet to recover tolerance has solved the problems that were found in your previous test.